JIMMY AKIN.ORG: The Face Of Chick? What you are looking at may be the first known, recent photo of Jack T. Chick (left) to emerge on the Internet. It is found on the home page of Victory Baptist Church in Clarkston, Michigan and is captioned as "Jack Chick & Pastor Bob Nogalski, Summer 2006." The figure alleged to be Chick is holding a copy of his tract Bad Bob! and pointing to Pastor Nogalski because of the similarity of Pastor Nogalski's life story to that of the character Bad Bob. The Victory Baptist Church web site also includes Pastor Nogalski's testimony regarding his life and how it intersects with Bad Bob's. VIEW THE PICTURE IN THE ORIGINAL CONTEXT. Now, the question on the minds of most JA.O readers will be: Is the photo of the reclusive Chick authentic? In our day and age, photos certainly can lie, and so I'd be interested to know what PhotoChoppers can make of the picture's authenticity. That's a subject I can't speak to, but perhaps we'll hear from some of them in the combox. What I can say is this: The man in the picture does look (apart from the comic expression on his face) much like I remember Jack Chick looking when I met him at the premier of his film, Light of the World. I can also say that the setting in which the picture was taken lends some credibility of the photo. It looks to me like the descriptions of the foyer of Chick Publications that I've read. 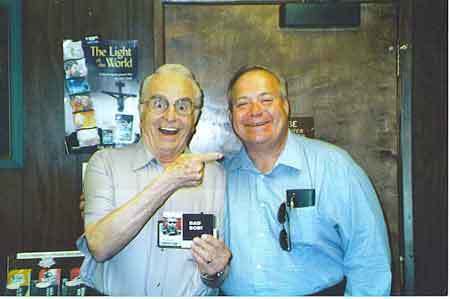 I would guess that Pastor Nogalski visited Chick Publications in Summer 2006, met Chick, and (impressed by the pastor's testimony regarding his connection with Bad Bob) Chick let the picture be taken, likely not realizing that it would find its way onto the Internet. I've thought about driving up to visit Chick's offices. They're just a couple of hours up the road from me. But I've never done it. Maybe after this picture, I will. It's a kinda funny picture. He looks like he's doing the Stephen Colbert pose. It looks authentic, to me, but whether it is of Jack Chick, I couldn't say. I find myself unable to get past the part of the pastor's testimony where he says that he "set his pants on fire". Maybe I'm being silly here, BUT...who cares what Jack Chick looks like? Check out their "Statement of Faith"! It is really something to behold. Aha! He's been found! Alert the killer albino monks! Oh, wait... I think I'm confusing my silly authors. Nevermind. Funny, I expected him to be dressed in some neo-Nazi uniform and burning the Pope in effegy. Goes to show how you really can't see people's souls. I wonder if he has any conception of how much evil he's done. I wonder if he takes any of this seriously or one day will be reveled as an athiest having fun. Did you see this drawing of Chick? -- someone altered yours, I think. Your story about meeting Chick was fascinating! I remember seeing one of his tracts after it had been stuck through the slots of my locker in high school. (I think someone did a big drop of them.) I'd never seen anything like it before, though it was not blatantly anti-Catholic. Boy, I feel bad for people who believe these things about the Church. They so need our prayers. What? Chick's offices are a couple hours from you? That must mean they're like 10 minutes from me... What down are they located? The first time I ever read Chick Tracts was when someone, and I have a good idea who, left a couple of them on the kitchen counter. I remember reading them thinking, "ok, this is kinda funny, but not that funny." Then it hit me that he was serious. The account of your meeting with Mr. Chick was indeed fascinating. Personally I imagined him being a bitter old man, paranoid to the point of living in a fortress with a tinfoil hat on his head at all times, judging from the bile he spews in all his comics and his nutty Vatican conspiracy theories. I didn't read another Chick comic for several years, until I found one in the house of a friend that was about the Virgin Mary. I picked it up thinking that it was a Catholic publication, and was almost dumbstricken at the load of BS that I read there. It was almost as disturbing as the one I had read before, though not nearly as much as another tract I found in the same house, this time talking about the Eucharist, which had a picture of a person taking communion, unknowingly receiving a demon within the sacred host. That, in my opinion, is the most blasphemous thing I've ever seen, and it really creeped me out, even though I knew it was nothing but a load of Protestant s***. This guy really needs our prayers, I can only imagine all the evil his publications have done. Mr. Chick will certainly have a lot to answer Jesus for, though I certainly think He will show him much more mercy than what Jack gives Him credit for (judging from the first Chick tract I read as a teenager). I hope he's mentally ill. Perhaps that would reduce his culpability.
" I knew it was nothing but a load of Protestant s***. " Chick's problems go way deeper than that. "It was almost as disturbing as the one I had read before, though not nearly as much as another tract I found in the same house, this time talking about the Eucharist, which had a picture of a person taking communion, unknowingly receiving a demon within the sacred host. That, in my opinion, is the most blasphemous thing I've ever seen, and it really creeped me out,"
That is, without doubt, the most atrocious thing I have heard yet!! I have seen some really stupid, & yes, insulting, things in Chick tracts, but that kind of accusation goes even beyond vile, or tasteless, or bigoted. You are absolutely right, Veronica: That is blasphemous in the extreme!! I remember my first major encounter with Chick Tracks. I had a summer job in a warehouse and I would find these angry little booklets in the bathroom--almost a new issue everyday. After reading "The Death Cookie" I was too offended to simply just flush it down the toilet and I brought it up to my manager. Turns out he was the one placing them! Well, I went a step up in the company hierarchy and finally got them to force the manager to quit placing them. If these hatefull little booklets are finding their way into your workplace, by all means do not keep quiet. Anti-Catholicism, for some reason, remains acceptable in mainstream society, even in the PC world we live in. We have to do what we can to defend the Church and ourselves from this type of hate. Is it just me or does the guy on the right look like Bosley from the TV Series, Charlie's Angels??? The picture looks funny to me. I have a passing interest in image processing and fauxtography and two things bother me in the picture. First, "Mr. Chick" seems to be sharper in resolution than Pastor Nogalski. Note how sharp all the interfaces look on "chick", while the pastor looks blurrier. Also, "chick" looks much more lit up than the pastor. If one looked at the picture in Photoshop with high magnification, it might be possible to find more indications of funniness. But, I can't think of why one would go to the trouble of photoshopping such an image. I guess my conspiracy skills are lacking. Maybe my concerns are the effect of the flash hitting chick straight on, while the pastor is off to the side. You can see the flash on the wall centered on chick. This would explain the funny lighting, but the differing sharpness? "Mr. Chick" seems to be sharper in resolution than Pastor Nogalski." He always looks that way. "Note how sharp all the interfaces look on "chick", while the pastor looks blurrier. Also, "chick" looks much more lit up than the pastor. That's because he's got the devil in him. Chick looks like a cardboard stand-up to me. That makes sense; I mean, what happened to his left shoulder? Esau, I think it's just the way his arm is positioned, plus the fact that he's turned a little to the left. I just positioned myself like that in front of a mirror and my left shoulder looked like his. I second Brent. What's the big deal about a photo of Chick? But bill912, if Chick is actually resting his left shoulder on that guy's chest; wouldn't you still see a portion of his shoulder? Also, it's kind of weird how if the Chick person there is real, why isn't there a greater impression left on the other guy's shirt as he's actually leaning against him? I mean, look at how uniform the impression (wrinkle) is on the guy's blue (?) shirt -- the same impression that would be left if it's merely a cardboard figure. If it were a real person, wouldn't there be a greater impression (i.e., more wrinkles) on the other guy's shirt since the weight of Chick's left shoulder/arm is actually resting against it? Instead, it's seems to be just a straight line; again, the same kind of indentation that would actually be left by a cardboard figure because of its edges. "As much as I sympathize with your reaction to that, Veronica, it would be a mistake to assume that Chick's main problem is his Protestantism." Oh I know. I have very good and sincere Protestant friends, and I'm sure that fanatical fundamentalist Protestants are probably in the minority. Admittedly Jack's has mental issues, however, his fanatical version of Christianity definitely played a role here. "I have seen some really stupid, & yes, insulting, things in Chick tracts, but that kind of accusation goes even beyond vile, or tasteless, or bigoted. You are absolutely right, Veronica: That is blasphemous in the extreme!!" Yes it is. "The Death Cookie" is what this comic full of Satanic-disguised-as-Protestantism lies is called. I do not reccommend anybody to read this, it will be hard to keep the blasphemous images out of your mind. I sincerely hope that Mr. Chick repents of all the evil he has done. Perhaps he is sincere in his belief that the Catholic Church and the Eucharist are evil, but lying outright like he has done, citing dubious sources and making wild assumptions without bothering to double-check the facts is still dishonest and cowardly. What a difference his tracts would have made in the world if he had talked about God's love instead of talking about Satan! Oh, I agree it's cardboard. Look at the angle at which Chick is leaning to the left. There is also a lot of reflected light in the background on either side of Chick's head, but little or none on his glasses. There seems to be a lot of light on Chick and Nogalski. Nogalski is squinting, while Chick's eyes are wide open. There is also a lot of reflected light in the background...but little or none on his glasses. That depends; if he has anti-reflective coating on his glasses (that is, if the Chick guy was actually a person), you wouldn't really notice any reflection on his glasses. Also, there seemed to be a hint of a reflection on the glasses (in the approx. center of the left lense; top left corner on the right), but can't really tell because of the blurry nature of the photo. Then again, you can simulate that on a cardboard as well. I thought that was just because he was smiling. Now we have a photo of Jack Chick. Now, who will be the first to photoshop Jack Chick? NO, it is I who will eat you! That, and the older article where you met Jack Chick was interesting. That photo above does resemble a card board pic tho. Does anyone else think his expression is very much like his cartoons? It's not cardboard. Look at where his arm is pressing into Nogalski. It wouldn't look like that with cardboard. Also his hand is clearly sticking out because it is not pressed against Nogalski. It could be photoshopped for all I know but in that case why use a cardboard cutout. Also why if you had a rare photo of Jack Chick would you use it to produce a big cardboard cutout of all things? I suspect the photo is real, and that Chick won't be inviting this Pastor Bob over again. Please refer to my Feb 16, 2007 3:41:56 PM post. Again, if you look at the wrinkle on the guy's blue shirt, it's seems to be just a straight line; again, the same kind of indentation that would actually be left by a cardboard figure because of its straight edge. If it were an actual person, I would think that there would be more wrinkles appearing on the guy's blue shirt, as Chick would seem to be leaning against the guy next to him (therefore, placing much of his weight or, at least, pressing his shoulder against the other guy) as well as the fact that the pattern of wrinkles would be more sporadic than a mere straight line, which, again, would be expected from a cardboard figure because of its straight edges. Plus, wouldn't the portion of his left shoulder still remain visible??? Yet, it seems odd that this isn't the case and all we have is his hand protruding there. I think it's far more likely that a photo of Jack Chick leaked onto the internet than that someone *found* a picture of Jack Chick making a ridiculous face and made a realistic life-size cutout. Plus, you can see that Chick's arm has the same harsh shadow against his body as his head has against the wall. "I suspect the photo is real, and that Chick won't be inviting this Pastor Bob over again." Why is that? Is Chick afraid of photography? That picture creeps me out, IMHO. Real or not, he's definitely cooky. "Note how sharp all the interfaces look on "chick", while the pastor looks blurrier. Also, "chick" looks much more lit up than the pastor."" If Jack Chick, indeed, does not allow for his picture to be taken, how in the world would someone manage to have a life-sized cardboard cutout of the man? If he's photoshopped in, how in the world does this Pastor Nogalski expect people to believe him about anything when he lied about this picture? And, I have to wonder just a bit why we're discussing the picture in such depth. "Does anyone else think his expression is very much like his cartoons?" This was my first impression as well, that he looked like his own drawings! The problem with Chick isn't that he's Protestant...it's that, in his world, God is cold and distant and Satan is underneath your bed. Conversion is motivated, not by love of God or of fellow man, but by fear of Hell and chainsaw wielding demons. If you identify Jack Chick as the enemy, just remember that we're supposed to love our enemies. Otherwise, I'm with Brent and Tim. Why should we care what he looks like? I think we should care what he looks like simply because he apparently doesn't want us to know what he looks like. Don't worry, Jared; we have secret pictures of him in the Jesuit Data Base. We have his home and office bugged. He can't make a move without us knowing about it. He doesn't want people to know what he looks like because no doubt he does sometimes go into public, and he has made so many enimies he doesn't want to deal with the animosity of strangers. At least that is what I assume. I wouldn't blame him for that, I would blame him for the words and actions that earned him that bad reputation. And Sean, yes, part of the problem is simply that he is Protestant. Protesants are always heretics in the objective sense, if not always in the subjective sense. That is a problem, especially since he is an old-school Protestant who activly protests the truth. It is true though that we should love our enimies, including Jack Chick. We should pray that he converts and gets employed by someone like Catholic Answers, working to undo the damage he has done. Careful, bill. I don't know if Mr. Chick has the ability to discern the humor in your remark. It could end up in one of his tracts as *proof* of the Catholic/Pagan/Atheist/Hollywood/Masonic plot to keep The Truth from being revealed. Plus, he might sic Bad Bob on you. What humor? We have a complete dossier on you,too, Tim. 1. The Muslim one how the Catholic Church founded Islam. 2. The one I think called the Godfathers how the Catholic Church created than killed the Russian Orthodox hierarchy, Communists, Masons, the Mafia and the Catholic Church is the real sinister creator of all of this. Speaking of "the files" bill912: Yours arrived on my desk this morning due to your recent breach of secrecy. Not wise, sir. We, at the Hollywood office, are not pleased. Your flail and cilice will be tainted with Mongolian influenza this week. If you survive, we'll be expecting an 800 word essay on "Why I found it necessary to tell the world about our clandestine ties." Either that, or your can just write "I will not share secrets" 100,000 times on the black board located beneath the Stalin-Capone archive in the Mohammedan Commons. Whichever assignment you choose will be due by Feb. 28 and one quarter (new non-leap-year calendar, of course). The "fact" that the Catholic Church invented Islam to take over Jerusalema and kill Christians and Jews is amazing. Why is Chick so reclusive with so few photographs? Does it speak to a level of paranoia? Maybe he thinks Vatican agents will be able to find him? Of course, if the Vatican did create and control Islam, Masons, Communism, etc... why haven't Vatican agents "taken him down" if he thinks that is what they do? The first time I found a Chick tract was in the semployee break room at a place I worked - I figured out who was leaving them there and I was flabbergasted it was the SWEETEST woman that worked in the joint. A little nutty, but sweet. The fact that nice and genuine people get sucked in by a recluse who publishes WILD claims L. Ron Hubbard can't touch. It is scary and sad. by the way, nice drawing, Jimmy. By the way, Jimmy should already know this since it says "used with permission" but the Wikipedia article on Jack Chick uses his drawing. Neat. BTW, why on earth would anyone create a photographic standup of Jack Chick? At the very least - even if THAT photo is doctored, it suggests that a photo WAS posed for. But is this a KNOWN issue with JTC? Does he disassociate with anyone who takes his photo/does not pose for photos? Simple Sinner: "...why haven't Vatican agents 'taken him down' if he thinks that is what they do?" Simple Sinner, we don't ask such things 'round here. Not if we want to keep posting in the blog-world with all ten fingers. Note to Bill912: Before you start spilling the beans ... ahem ... I mean MAKING UP RIDICULOUS STORIES ... about how Chick is secretly a Jesuit plant (like Mohammed), remember your most recent punishment. Jack Chick is NOT NOT NOT NOT a Vatican agent. He told me so himself. No wait, I mean, I've never met the guy! I got a copy of "The Death Cookie" tract. It was so full of ridiculous misinterpretations, I thought it was hilarious. I actually showed it to the girl that I was sponsoring into the Catholic Church that Easter. She was amazed that someone would go to such extremes of lunacy. BTW, yes, she still got baptized and confirmed into the Catholic faith. Every once in a while, we will call each other, to make sure we're still "eating the death cookie". THAT is a fantastic phrase! I might just find myself using it. It's time to update this Wikipedia with new photo! Anyone care to update? LOL! I used to give out Jack Chick tracts. I've been a Catholic for 28 years. Guess God gets the last laugh. I have a coworker who likes to casually refer to the pope as the anti-Christ. Being exposed to incidents like this and the Jack Chick tracts really makes me wonder why the same approach does not work on Protestants. Why is it that a Protestant (or Dan Brown, or Hislop, or Carpenter) can cook up the most cockamamy stories, provide only dubious or circumstantial evidence, and it instantly is accepted as the gospel truth when at the same time everyone KNOWS that Luther changed Christian theology inventing Sola Scriptura out of whole cloth and CHANGED THE BIBLE yet no one thinks this is pertinent to the whole Protestant-Catholic thing? Yet you never see Jack Cath tracts with diabolical portrayals of Luther taking it upon himself to alter a 1,500 year-old canon in order to replace it with an OT used by Jews who rejected Christ and a NT that fit his dumbed-down version of Christianity. By the way, that photo is real. 1) The top of Chick's left forearm is being lit by the pale blue light reflecting off Bob's shirt. 2) Creases in the Chick's right shirt sleeve match the placing of Bob's fingers. 3) There is a slightly unnatural curve to Chick's upper torso to accommodate Bob's arm around him. If Bob did not really have his arm behind Chick, he would be very uncomfortable standing with his chest thrusting while leaning. 4) The door jam to Bob's right catches part of the same flash that is set squarely on Chick's head. Because door jams angle inward, it catches a part of the flash but the flat door and wall on either side do not. 5) Pixelated edges occur "naturally" in digital photos and digitized photos. I remember earlier last summer there was an uproar over Reuters altering photos and suddenly everyone thought that even pictures of Castro were fake. But clearly they were not. He is, after all, on a list of who's who for 13 April birthdays. Listed, for some odd reason, as a "cartoonist". Kind of like calling Nero a "violinist" if you ask me. So he is famous. Way more famous than I will ever be, that is for sure. But I admire his desire to shun the spotlight. After all, he is a cartoonist and not an actor, or singer, or American Idol attention-hog. I am betting even Dan Brown could not be recognized by the average person despite the fact he slathers his likeness both on his book covers as well as in his text as the hero. Also, there is a virtuous aspect in how he will not exploit his fame for worldly gain -- very much unlike the great heresiarchs of Mohammed, Luther, and Smith. Then again, Chick is from an altogether lower choir seeing as he is not so much creating new heresies as he is just collecting and recycling old lies about an entity he obviously sincerely believes is Satanic. OTOH, secrecy would have to be part of the whole act, now would it not? I mean, the more he pretends to duck around and slink in his holy shadows, the more credibility he adds to his fantasies. Kind of like a Bible-bearing Walter Mitty. Could he tell stories about an institution so powerful and cruel as his image of the Catholic Church and not at least PRETEND to be afraid for his life? This begs another question: If this is how he gains credibility, then why are not those who print, ship, sell, and pass out these pamphlets also afraid for their lives? I remember when I was an alien conspiracy monger in college, I never felt like telling people the deep dark secrets because I feared for them as much as I feared for myself. The whole set-up seems anything but heroic for Chick and calls into question the degree to which his followers actually buy in to what he preaches. Could it possibly be that their highest loyalty is not to the Truth but to the Effect? Which is one of several reasons why you would not want Pastor Bob to display his jpegs on his website. I always have found the Chick tracks to be extremely hurtful, mostly because they are so insidious, and small, and unexpected. I was mailed one once when I was 14 years old by a "friend"/pen pal who -- turned out -- wanted to "save me" from Catholicism to become Baptist. I tear open the envelope and out drops this little comic book thing, which is searingly insulting to an earnest 14-year-old boy. But the fact that you can find them in your locker (slid through the slits) or on the floor of a college lecture hall, or just about anywhere, makes them like little spiritual hand grenades. I guess we all know it, but the man has an awful lot of evil to answer for, especially for violating the "speak the truth in Love" part of scripture, for even if he has believed he's speaking the truth, he certainly hasn't been doing it in love. I thought the Chick tracts were pathetic and bizaare when I was an Episcopalian, and I think they're equally idiotic as a Catholic. Funny, I may have been a heretic when I was an Episcopalian, but at least I had the good sense (or perhaps the grace) to identify with Catholicism rather than Chick's rabid and reprehensible fundamentalism. Hi there Jimmy! You don´t even know, but it´s a plesure see you again after some years... In the past, when I was sixteen I visited a site of you (I forgot what site, but I´ve remember some pics about your medieval wedding!) to improving my catholics apologetics knowledge... But, about Chick: what an interesting photo! :D I remembered a comic about the "wafer jesus" that let me in a long confuse days... In the past! So... I just want to say THANK YOU for you evangelistic effort to get catholics - like me!! - stronger in thei faith. Man, you must know that here, at Brazil, you have someone praying for your life and your work to save souls. God bless you! Jack Chick looks very healthy here. I guess there is still time for him to repent and change his ways! Sadly, Alberto Rivera cannot say the same. I wanted to let you know I read Catholic Answers page on the Chick tracts. Even though the ones he does that preach salvation through Christ don't bother me, it's pretty obvious this man has a wild spur up his nose towards the Catholic Church. I'm glad I read the page because it relieved me somewhat after having looked at those anti-Catholic tracts. Why does he want to stir up hostility with Protestants and unbelievers towards the Catholic Church? Last year, I e-mailed his website explaining that the Catholic Church has a prayer to Jesus for forgiveness of our sins (Oh, my Jesus, forgive us our sins, etc.) and never got a reply. Even though there are Evangelical/Orthodox Catholics in the Church, Mr. Chick won't even give them lip service. And here's something that surprised me. I read an updated version of his tract "Humbug," and he removed all references to Christmas (I thought that was only garbage the ACLU did)! In spite of this sort of bashing here, we still need to pray for him instead of condemning him. My in-laws are protestants who swallow Chick's conspiracies hook, line, sinker and pole! I used to be a nominal/fallen away Catholic who married a protestant. After reading Chick tracts and many Catholic apologists like Jimmy I find myself going to mass and pursuing a return to the Church! Someone should follow Tim Staples lead and write a book called "How Jack Chick made me a Catholic". The funny thing about those tracts is how Chick writes a wild conspiracy theory and in many cases (such as in the tract "Why is Mary Crying?") Chick's only sources are writings put out by his own publishing company. I also love how Chick says if you want to know the truth about Catholic doctrine you need to buy other books from Chick publications (and give him your money! )rather than reading official (and often free) Catholic Church sources. It isn't 'hostile' or 'mean' to warn people that praying to Mary is unbiblical or that confessing sins to a priest isn't Biblical or that the Pope is a sinner like everyone else or that most of the tenets of the Catholic dogma DO NOT align with the Bible. If Jack Chick is trying to warn people that their souls are in danger and that they need to trust in Jesus alone--instead of following a false manmade dogma--I'd say that Chick is demonstrating great love for others. But then again, most people don't really want the truth and so will perish. "The path to salvation is narrow and few find it but the road to destruction is broad and most travel on it," Jesus Christ. Well, you sure don't want the truth, or you would find out what the Catholic Church *actually* teaches, instead of swallowing Chick's bilge without checking to find out if he knows what he's talking about. BTW, Sola Scriptura DOESN'T align with the Bible. Let me see, Jack Chick -- who must rely on falsehoods, deceptions and half-truths about what the Catholic Church teaches to get his point across -- says that my soul is in danger if I follow the examples of Mary, St. Peter, St. Paul, St. Augustine, St. Thomas Aquinas, St. Francis of Assisi, St. John of the Cross. Jack Chick says that my soul is in danger if I accept and take to heart the words of Christ, who instructed us to remember him in the Eucharist, to Baptize in the name of the Father, the Son and the Holy Spirit, and who gave his first priests the power, and the duty, to forgive sins in his name. Should I rely on Jack Chick and his man-made dogma? Or should I rely on the one Christ told me to rely on, the one that holds the office of the keys given to St. Peter? Should I rely on Jack Chick and his lies, deceptions and distortions, or should I rely on the Church which is the pillar and foundation of truth? I'll take my chances with the Vicar of Christ, thank you. "Dark Dungeons" was enough to tell me that Jack didn't know what the hell he was talking about in one occasion, which made it easy enough for me to see what kind of lies people tell about the Catholic Church in such tracts too. Which reminds me, off hand, that I really wish that one priest who still talks on EWTN occasionally about the evils of Dungeons & Dragons would have the research experience of watching a half dozen nerds like myself eating Cheetos and Mountain Dew in someone's basement. The scariest thing we do is say things like "I cast magic missile at the orc doing... (rolls dice) 7 hit points of damage! Woot woot!" As an atheist, I'm a (cynical) non-believer but not one to knock the views of others - providing that they are focussing on the positive of any religion, which can only benefit society at large. Jack Chick's writings strike me (as a cynical Brit) as deeply disturbing as many other evangelical religions, and positively dangerous. Is he deliberately trying to provoke a response, or just cause a civil war within Christendom? Whilst I respect the ability of free speech to question life and religion, surely this guy is going too far and should be slapped back down as a dangerous fruitcake? You all should look to the heavens, not for god, but ask yourself what are those trail of chemicals, being left by those jets,go and find out about contrails and chemtrails then give thanks to the catholic church. BLIND FAITH! There is no reason to assume Chick "hates Catholics" on the things I've seen he's done. It is pretty safe to say he hates "Catholicism" because he's worried about the eternal destination of souls and feels "Catholicism" leads folks astray by teaching a lot of things that are unbiblical. What I think his aim is, (or at least in my opinion should be) is to cause people to question their faith in the vein of "what does the Bible say about what my religion teaches". If your religion, no matter what denomination, teaches biblical truth and the Bible as the ultimate authority for revelation of God's character and plan for salvation then your examination of it's tenets will do for you one of two things: Strengthen your resolve and "KNOW" what you believe by reinforcement of your beliefs through verification with God's Word or reveal areas where your religion differs or goes against the Bible's teaching, causing you to, hopefully, begin to search for the truth. People can worship who they want how they want, but I hope nobody would do it, ignorantly, or from being misled. "Ignorantly" is an appropriate word to use when discussing Chick. It is NOT "pretty safe to say that he hates 'Catholicism'." Chick doesn't know a darned thing about what the Catholic Church teaches. He has his own beliefs of what the Catholic Church teaches, which bear little or no resemblance to reality. He sets up a strawman church, calls it "The Roman Catholic Church", imputes certain teachings to it, then attacks those "teachings". Chick's ignorance is culpable because the teachings of the Catholic Church are not secret, not hidden. One can read the Catechism or investigate websites such as catholic.com and ewtn.com and find out what the Church teaches. So, Chick does not hate "Catholicism"; he may hate the strawman church that exists in his mind, but what he hates is a phantom. I'm curious as to why you didn't just refer me to the Bible to find out what the "Catholic Church" teaches. What is so signifigant about the "Catechism" that it is referenced first? Is it a statement of faith based on the Bible, or what? Please forgive my ignorance... and why is calling the "Catholic Church" the "Roman Catholic Church" a bad thing? Is there an implication there? The Bible doesn't say that the Bible is the sole rule of Faith. Jesus established a Church to which He gave His Authority. Members of that Church wrote the books of the Bible, and, over a period of about three and a half centuries, the Pope and bishops of that Church, inspired by the Holy Spirit(as Jesus promised in Matthew 16) determined which books belong in the Bible and which don't (see "Where We Got The Bible", by Henry G. Graham). The Roman Catholic Church is one of 22 churches which make up the Catholic Church. The other churches are Eastern Catholic churches which either did not reject the authority of the pope in 1054, or later returned to union with the pope. One needs an authority to interpret the Bible: "First of all you must understand this, that no prophecy of scripture is a matter of one's own interpretation, because no prophecy ever cane by the impulse of man, but men moved by the Holy Spirit spoke from God." (2 Peter 1:20-21). Who has that authority? "...the church of the living God, the pillar and bulwark of the truth." (1 Timothy 3:15). So if I'm understanding what you're implying, the "Catholic Church" is the "only" authority for interpretation of the Bible? The first verse you quoted seems to be saying that you can't interpret the Bible to say what you want it to say, It says what it says what it says...but you're only able to understand it if your moved by the Holy Spirit. Is that correct? And the second one, just so I can see if I'm understanding it correctly, I thought the "church of the living God" was the people who sincerely professed faith in salvation through Christ's death, burial and resurrection. If I am correct then doesn't that mean anyone who is sincere about their profession of faith in Christ qualifies as part of the "church of the living God"? And IF that is the case, then why can't "laymen" have the ability to properly interpret scripture? And if what you say is true, and I am understanding your explanations correctly, you must be a priest of the Catholic faith and I am wrong in my thinking as posted above.